This mod allows you to see the resources and some blocks through the wall, ground and other obstacles. After installing the mod, go to any world, and press the XRay buttom. This will open a special menu where you can enable and configure the settings for this mod. After this, go to settings and enable or disable the "fancy graphics". This setting acts as a switch. 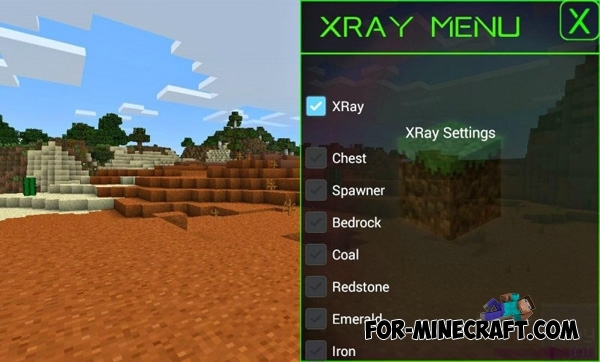 X-Ray HACK for Minecraft PE 0.11.1 / 0.11.0By installing this hack, you can fast find diamonds, iron, and other things without having to search for them digging the endless mine.